The Bosch HS1470 3/4 in. x 10 in. 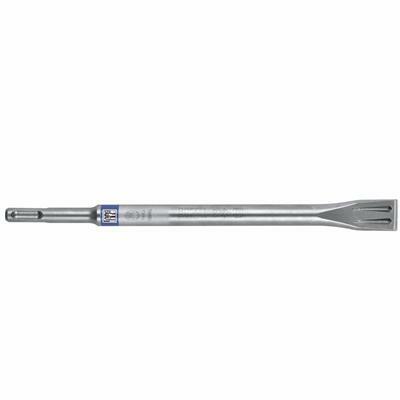 SDS-Plus Bulldog Xtreme Viper Flat Chisel is ideal for demolition work, breakthroughs, adjustment work, restoring joints and clearing reinforcements. It provides a unique cutting head with Power Ribs and Viper Teeth, which are extra wedges for faster breakout. They create not only lateral cracks but also additional vertical cracks, for a no-jam design. This self-sharpening tool provides longer life and no additional sharpening hassle.